This Ayurvedic guest house is situated at Mihintale which is 13km east of the Anuradhapura Ancient City (UNESCO World Heritage Site) and is 20 minutes walking distance to the Mihintale Rock Temple and Kanadarawa Tank. I am Ayurvedic Doctor A.Nandasena, an experienced Ayurvedic physcian registered for 35 years; 12021 under the Ayurvedic Department of Sri Lanka. I am living in Missaka Mawatha, Mihintale, Sri Lanka. I am a Sinhala Buddhist person, who comes from a traditional Ayurvedic generation. I have 5 family members, they support my Ayurvedic treatments, especially my wife Chandrana Kamal Rajakaruna helps me. My father is Ayurvedic Doctor Manik Ralage Appuhami and my mother is Punchihami is also from a family with Ayurvedic background for generations. I am the 70th Ayurvedic doctor of the Ayurvedic lineage of our family, which is called ''Mahaketiyawe Maha Weda Ancestry''. So Ayurveda knowledge has been passed down successively from generation to generation. In Sri Lanka, ist has simply become a way of life for millions. I have 200 palm leaf books and I treat all physical parts of the human body. Aditionally I know traditional charm [Gurukam] and can treat persons in this way, too. Treatments methods contain my own herbals which are produced at my private hospital laboratory. Sri Lanka has its own Ayurvedic system based on a series of prescriptions handed down from generation to generation over a period of 2500 years. Ancient inscriptions on rock surfaces reveal the full establishment of the medical services, which existed within the country. Ancient hospital complexes which were active centuries ago, and those ancient ruins are the best evidences of our ancient Ayurveda history. There are many local and foreign tourists visiting those ancient hospitals, because these are highly attractive ruins. They have come to symbolize a sense of healing and care which was so prevalent already at that early time. The interrelationship between Ayurveda and royalty has brought Buddhism and medical care into a top position in Sri Lankan administration. In Sri Lanka, Ayurvedic training includes western medicine alongside traditional Ayurvedic subjects. The diploma can only be acquired after a 6 year full-time training at a government university. The Ministry of Health controls the Department of Ayurveda, headed by the Commissioner of Ayurveda, the Ayurvedic Drug Corporation and the Ayurvedic Research Institute. The Ayurvedic Medical Council maintains and controls the registration of physicians and code of practice, ethics and conduct. Ayurveda has its own unique quality and thus it treats the person, rather than the disease. Who is my friend Nuwan? Nuwan is my nearest neighbour, living in only 50 metres distance from my home. Nuwan is an experienced tourist guide/driver/chaufer guide in Sri Lanka since 2003. He is very qualified and his guiding licence is registered as A-706 under the Sri Lanka Tourist Devolopment Authority (SLTDA). I have been knowing him since the year 2000 and our families are good friends. As he has international contacts with holiday makers in Sri Lanka, we agreed to share this Sinhala Ayurvedic Medicine information with the entire world. Why choose Nuwan's Ayurvedic Villa Guest House in Mihintale, Sri Lanka?. It is an convenient place for Sri Lanka holidaymakers and everyone who comes to Sri Lanka for Ayurveda resorts or treatments, looking for such facilities in the Cultural Triangle of Sri Lanka, which is the North Central Province. 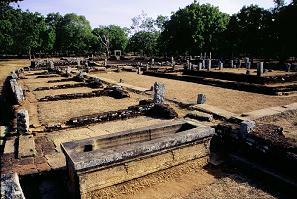 It is also the heart of Sri Lankan Buddhist history and culture. Whenever you enjoy Sri Lankan Ayurvedic treatment in our guest house you have lots of advantages. One main advantage is: This treatments contain natural herbs which are found in nearby forests. This Ayurvedic guest house is run by Nuwan's Family and my family jointly. So you can learn personally about our culture staying with two different local families at this place. And we really offer fair prices, we have not any outside servents, cleaning, cooking, driving, guiding and other services are done by ourselves or our family members respectivley.